Crosman 1077 CO2 rifle and sight "upgrade"
About 10 years ago I had MP-60 PCP rifle - and it was quite a pain to shoot. Reload after each shoot, somewhat non-straight recoil... This semi-automatic Crosman 1077 promises better experience with it's CO2 and 12-shot clip. Since army times (and BF3) I didn't liked open sight, so I had to successively get 2 collimatior sights - pure noname chinese (right) and ZOS HQ 434 (left). ZOS has dichroic collimator, so it only shows red reticle. Chinese one has simpler semi-transparent mirror coating and has 2 reticle colors - green and red. But image quality on Chinese one was not very pleasing (looked a bit blurry and faint double-image), so I tried ZOS. 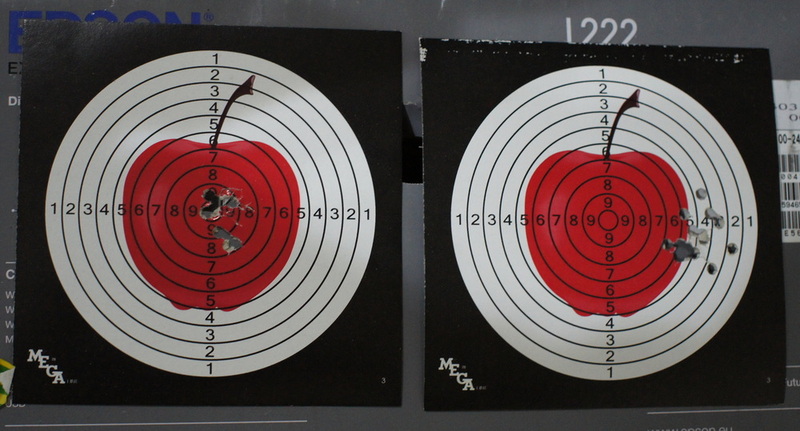 Unfortunately it was impossible to set stright up ZOS on Crosman's 11mm rail, it was always somewhat tilted. Initially I was thinking it's Crosman bad assembly of the case, but even after rifle reassembly issue with ZOS was still there. So I had to make a hybrid - use collimator from ZOS and install it into Chinese sight. When gluing it - forgot that cyanoacrylate glue leaves matte residue on all optical surfaces around. Luckily I was able to remove it with dimethyl sulfoxide (gloves are a must, it easily penetrates skin!!!). 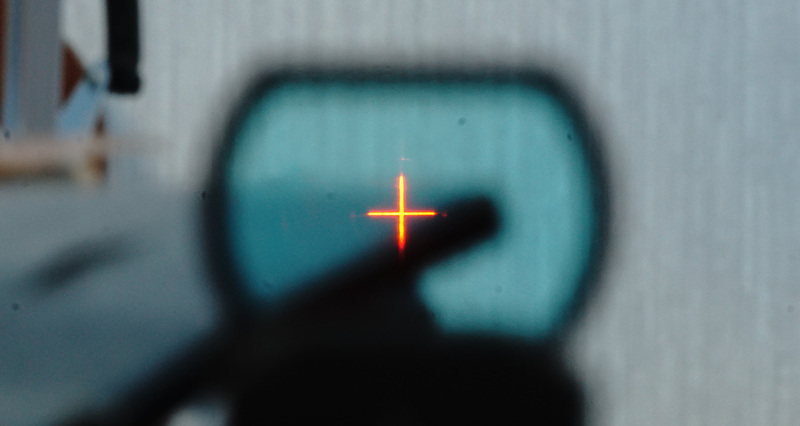 In normal conditions, especially in daylight reticle image quality is acceptable. But at night eye pupil gets larger and image quality slightly degrades. After fire adjustment it all works properly (right target was the first one, with open sight). In general, Crosman 1077 is very nice rifle. CO2, 12-shot clip and semi-auto fire makes it a pleasure to use. 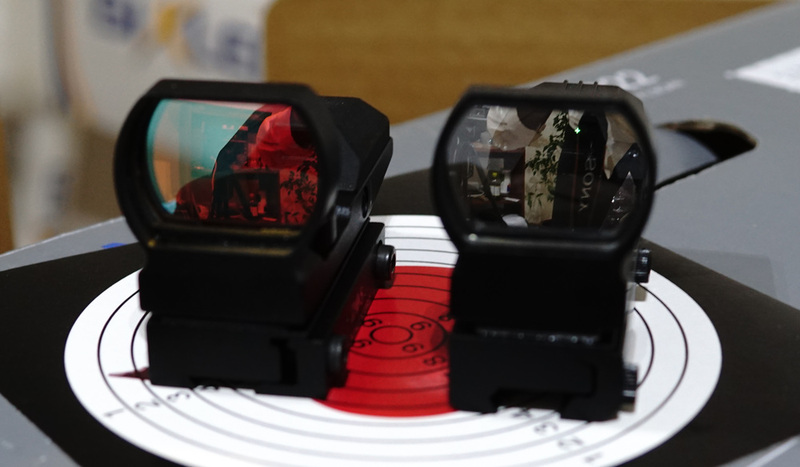 But Chinese collimator sights have lots of room for improvement.